” Around one third of Australians live outside metropolitan areas, and about two per cent of the population live in remote and very remote locations.  Have lower levels of health literacy. For those living in rural, regional and remote Australia, finding services can often be difficult, if not impossible. I am proud to introduce the Health Insurance Amendment (National Rural Health Commissioner) Bill, which amends the Health Insurance Act 1973 for the purpose of establishing Australia’s first National Rural Health Commissioner. This, Mr Speaker, is an incredible and historic occasion. An historic occasion for the Coalition, the National Party, and the third of our population that call regional, rural and remote Australia home. This, Mr Speaker, is an historic occasion for our nation. Improving access to quality health care for people, no matter where they live is a priority of this Coalition Government. As a medical practitioner, who has worked for more than 20 years as a doctor in regional Australia, I am so proud and privileged to be here today to deliver this crucial commitment. From my professional background, I understand the many pressures facing our hard working members of the broad health sector. Our doctors, our nurses, dentists and allied health workers. Our Indigenous health workers, mental health workers, our midwives – we understand these people, what they are up against and we understand the needs of Australians in regional, rural and remote Australia. We understand that it takes a toughness and a boldness, coupled with a deep sensitivity, to work in health in rural and remote areas. Since Australia’s pioneering days, before telecommunications, we found ways to overcome isolation between the new colonies. We did that – we are a nation that has overcome geographic challenges, having one of the largest land-masses in the world, and the largest search and rescue regions in the world. And it was the then Minister for Rural Health, Senator Fiona Nash, our Deputy Leader of the Nationals who made this bold and historic commitment. Mr Speaker, I commend to the house these two incredible leaders, who are champions for regional and rural communities in their own right. As a member of the National Party and the Assistant Minister for Health, I have reiterated that this Government is committed to bridging the city-country divide. For more than 20 years I served in areas many hours’ drive away from a major metropolitan city. I was a consultant specialist Gastroenterologist through regional hospitals for much of this time, and I have felt the demand that is on regional health services and staff. The common problems encountered in the bush necessitate the development and application of a dedicated framework which supports a nationally coordinated approach that is also adaptable to local conditions. Our commitment today is to ensure that regional, rural and remote communities will have a champion to advocate on their behalf so they are able to receive the support they need to deliver health services to local people. This is guided by a deep lying principle that every Australian should have the right to access a high quality standard of health care, no matter where they live. To this end, this Bill will pave the way to establish Australia’s first-ever National Rural Health Commissioner. The Commissioner is an integral part of our broader agenda to reform rural health in this nation. Establishing this role will be achieved by amending the Health Insurance Act 1973, which will provide for the Commissioner to be a statutory position, enabling them to carry out their duties independently and transparently. 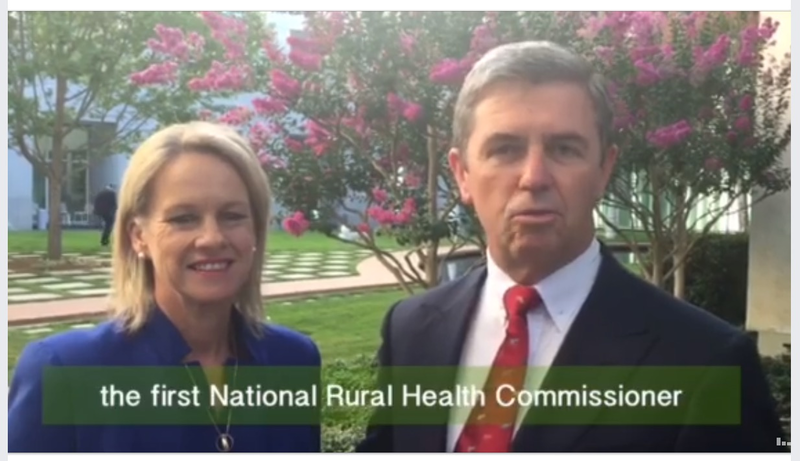 The Commissioner will work with regional, rural and remote communities, the health sector, universities, specialist training colleges and across all levels of government to improve rural health policies and champion the cause of rural practice. The position will be independent and impartial. A fearless champion. The Commissioner will be someone who has extensive experience within the rural health sector, who is capable of collaborating and consulting closely with a broad range of stakeholders, and who has a passion for improving health outcomes in regional, rural and remote Australia. The Commissioner will be appointed for a period of two years, with a reappointment up until 30 June 2020. As a part of the role, the Commissioner will be required to submit a report to the responsible Minister. This will outline findings and recommendations for consideration by Government. The Commissioner will not be able to delegate his or her powers to anyone else, they will not hold any financial delegation powers, nor will they have any specific employment powers. The Commissioner will be assisted by staff from the Department of Health throughout the duration of their term. Once appointed, the Commissioner’s first priority will be to develop National Rural Generalist Pathways. The aim of these Pathways will be to address the most serious issue confronting the rural health sector- the lack of access to training for doctors in regional, rural and remote communities. Attracting and retaining more doctors and health professionals into country areas is essential if we are to improve access to health care in the bush. Rural Generalists are faced with a unique set of challenges, and the Commissioner will examine these while developing the generalist pathways. It is widely recognised that Rural Generalists often have advanced training and a broader skill-set than is required by doctors in metropolitan centres. In many instances, they perform duties in areas such as general surgery, obstetrics, anaesthetics and mental health. They not only work longer hours but are frequently on-call afterhours in acute care settings, such as accident and emergency hospital admitted patient care. However, despite the Rural Generalists’ multidisciplinary skill-set, demanding workload and geographic isolation, there is no national scheme in place which properly recognises this set of circumstances. In developing the National Rural Generalist Pathways, the Commissioner will consult with the health sector and training providers to define what it means to be a Rural Generalist. The Commissioner will also examine appropriate remuneration for Rural Generalists, to ensure their extra skills and working hours are recognised. By addressing these areas, the Pathways will help to encourage more doctors to practice in regional, rural and remote Australia. While the development of the Pathways will be the Commissioner’s first priority, the needs of nursing, dental health, Indigenous health, mental health, midwifery and allied health stakeholders will also be considered. Health care planning, programs and service delivery models must be adapted to meet the widely differing health needs of rural communities and overcome the challenges of geographic spread, low population density, limited infrastructure and the significantly higher costs of rural and remote health care delivery. In rural and remote areas, partnerships across health care sectors and between health care providers and other sectors will help address the economic and social determinants of health that are essential to meeting the needs of these communities. The Commissioner will form and strengthen these relationships, across the professions and for communities. I’d also like to take this opportunity to thank the Health Workforce Division within my Department who have assisted in developing this important initiative of our Government. In addition to establishing the role of the Commissioner, this Bill also contains two other amendments to the Health Insurance Act 1973. It will repeal section 3GC of the Act, to abolish the Medical Training Review Panel. In October 2014, members of the Medical Training Review Panel identified an overlap between their functions and those of the National Medical Training Advisory Network. Part of the advisory network’s functions is to provide advice on medical workforce planning and medical training plans to inform government, employers and educators. Given this focus, it was agreed that the advisory network could pick up the panel’s annual reporting obligations on medical education and training, and that the panel’s role would cease. This measure will simplify legislation in the Health portfolio. The other amendment will be the repeal of section 19AD of the Act. This will not affect any medical practitioner subject to the legislation, and will not affect the operation of any current workforce or training programs. It will remove a burdensome and ineffective process which required a review every five years of the operation of the Medicare provider number legislation, subsections 19AA, 3GA and 3GC of the Health Insurance Act 1973. Previous reviews have not resulted in operational improvements to the legislation. Furthermore, recent developments in systems supporting Medicare provider number legislation and processes are not captured by Section 19AD. Repealing this ineffectual measure in the Act is a necessary measure. To sum up, this Bill is an important step forward for regional, rural and remote health in Australia. This Coalition Government recognises the value of our rural communities and the special place they hold within the fabric of this country. People living in these communities make an enormous contribution to our national economy, and to the culture and character of Australia. Access to a quality standard of health care is what they deserve and are entitled to expect. The key is to recruit and retain more doctors and health professionals outside of the major cities, and that will be the focus of the National Rural Health Commissioner. With the appropriate training opportunities, recruitment, remuneration and ongoing support, the Government is confident that more people will be encouraged to pursue a rewarding career in rural health. Regional, rural and remote health is built on the commitment, the expertise and the courage of its workforce. We have some of the most resilient and passionate people working in this sector. The formation of the Commissioner will help to provide the rural health workforce with the support it needs to carry out its vitally important work. Finally, I, together with the Commissioner will champion the incredible and rewarding opportunities of a career in rural medicine. We will do our best to hear you, to listen to you, and to make the necessary steps for our health system to work better for you. Our Coalition Government looks forward to working closely with the National Rural Health Commissioner to ensure we can improve access to health services for all the men and women who call regional, rural and remote Australia home.